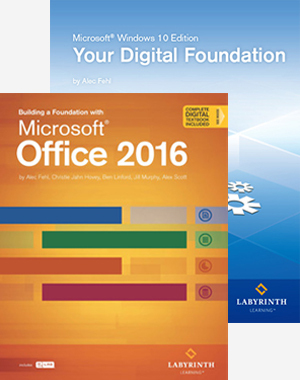 Building a Foundation with Microsoft Office 2016 Digital ebook AND Your Digital Foundation ebook: This bundle, of our most popular titles, offers a comprehensive learning solution of essential computer concept skills as well as the four Microsoft Office Applications - Word, Excel, PowerPoint and Access. 1. Your Digital Foundation: Using interactive elements and an instructional design, this text will provide learners with a solid understanding of file management, computer concepts, the Internet, email, Windows and cloud computing. 2. Building a Foundation with Microsoft 2016: Offers an in-depth look at the most relevant topics in the four Office 2016 applications: Word, Excel, PowerPoint and Access. Following several lessons on each application, the text concludes with a comprehensive, capstone integration project that incorporates skills from every application. Our fully interactive ebooks deliver video, bite-sized content, integrated assessments and more to visually reinforce textbook concepts. That’s 0% Paper, 100% Brilliant. Instructors will save time and boost engagement! MOS Certified.